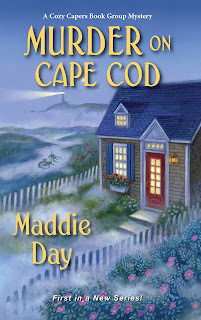 Gin Malloy, here, from Maddie Day's Cozy Capers Book Group Mysteries. Hi, gang. I understand you all like cozy mysteries, too! That's wicked awesome. Mac Almeida and I are members of the Cozy Capers book group here in Westham on Cape Cod, and all we read are cozies, one a week, in fact. The book group members are shop owners or other luminaries in town. I run Salty Taffy's candy shop. Mac has Mac's Bikes. Zane owns the distillery and liquor store. But we also have our head librarian, a retired chief of police, the town clerk, and Mac's brother. 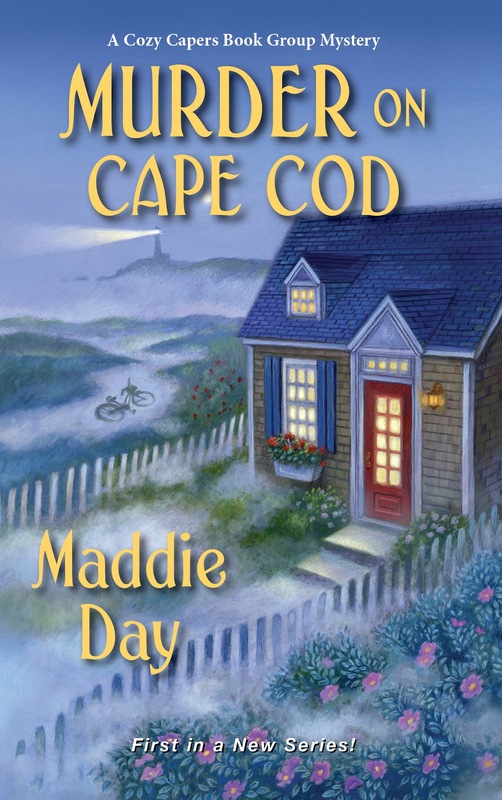 So Maddie Day says she has a stack of advance copies of Murder on Cape Cod and wants to give away not one but two here today. Cool, huh? So readers, what have you stumbled over lately? Was it good or bad? Be sure to leave your email address so Maddie can contact you. The book releases in a Barnes & Noble paperback exclusive December 18 (and on all platforms a year later). Thank goodness I have not stumbled over any bodies, but I have been stumbling over mess after mess in my house! Need to get busy cleaning! I keep stumbling over the cat. Yesterday I stepped on her tail & fell into the refrigerator. She makes life interesting. I did stumble over a body once, when I was on my way to school. It was in a ditch. They never told me if he was drunk or dead. I have always wondered about it. Anyway, that's my stumbling adventure! I have not stumbled over anything lately but my little grandsons tumbled over me. Congratulations on your release; I am soooo anxious to read your book as I've lived on The Cape and love to read about places I've lived or visited especially when they are books that a favorite author writes. Jeannie, you are one of the randomly selected winners! Congratulations, and please check your email. Thankfully I haven't stumbled over any bodies or anything to make me trip since I seem to be able to fall well enough without tripping. :( I did stumble onto some very interesting family history though. I inherited tons of stuff from our families past after the passing of my parents who had inherited from their parents and so on. When we moved to the Ozark Mountains last year, we downsized and disposed of a lot of this "stuff" that had no significance to us other than it belonged to someone. What we felt was important and needed more time to go through than when moving was put in boxes to go through slowly and thoroughly so as not to toss something of significance. Among one of those boxes, I found a newspaper article about the passing of my great, great grandmother. It stated that she was born in Izard County. Now Izard County is adjacent to Stone County where I live. In fact, the county line is just outside the city limits on the other side of town from where we live. Also what is now Stone County use to be Izard County. The piece of property we owned had been in that one family for years and was homesteaded at the same time frame as this ancestor of mine. Makes one think - did my relative and this property owner know each other? Could they have been friends or adjoining property owners? Then it made me think about how we hadn't moved to a new place but rather maybe I was returning to my ancestors stomping grounds. It makes our move and living here all the more special to me. We had always loved it here but maybe it was just a part of me calling me back. I come close to stumbling on a daily basis when I walk my two cockers. GloryBee tends to zigzag in front of me while Mercy trots along my left side. Thank you for the giveaway. This sounds like another wonderful series to explore! At my age the only thing I'm likely to stumble over are my own feet. Although if I did trip over a body, I'd have loads of helpers in solving what happened. SIL is NYPD Officer, D.S. #2 is connected to Homeland. Oh I also have 5 liars..... I mean lawyers in the family, a retired Appellate Court Justice and SIL's uncle is a sitting State Supreme Court Justice. LOTS OF HELP!!! I stumbled over the corner of the dishwasher. It was really bad. Let's just say lots of blood a trip to the emergency room, a tetanus shot and lots of stitches were involved. I stumbled over my neighbor's puppy. I definitely stumbled on something, but I have a sore, bruised toe. It was probably trying to avoid one of the cats, you would think I would remember since I have a really purple toe. Stepped in a hole in yard while taking my dog out and sprained my ankle! Usually one of my kitties. They like to slowly walk ahead of me instead of following. What can I say? They are cats, unless they are stumbled over or hungry. Looking forward to starting a new series😊! I foster Kittens and I trip over them constantly.it' a good day when no new bruises!!! I do tend to stumble over my own feet. Nothing too drastic though. Mary, you are one of the randomly selected winners! Congratulations, and please check your email. I am forever stumbling over our 140 lb Bull Mastiff / Boxer mix. He lies where I have to climb over him which makes it hard to leave my room at night to take my little dog outside. I'm always stumbling over my crazy dog---he loves to be as close to me as possible.